Councillor Hugh Hunter retired today (Wednesday 27 January) as Leader of South Ayrshire Council. Councillor Hunter (pictured above) made the decision to step down to allow for “a new era of leadership.” He confirmed he would continue to serve as a Conservative Councillor for the Prestwick ward where he was first elected in 1999. 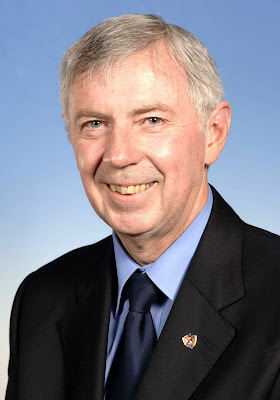 Councillor Bill McIntosh is the new Leader of the Conservative Group. He is currently the portfolio holder for Resource and Performance. Councillor Hunter said: “I have been honoured to serve as South Ayrshire Council’s Leader. We have made huge progress in the last three years in becoming a modern, ambitious organisation focussed on delivering high quality services for the people of South Ayrshire. I have worked hard with my portfolio holders and fellow elected members to make strong, sustained progress. I am proud of what we have achieved. I believe the time is right for a new era of leadership to steer the Council through the challenging times that lie ahead. “While I am retiring from the office of Leader, I will continue to serve the people of Prestwick as their local Councillor to the best of my abilities and do everything in my power to represent them well. 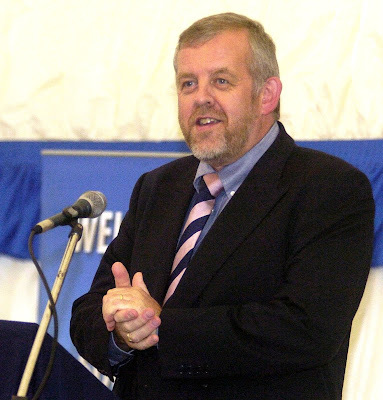 South Ayrshire Council chief executive David Anderson (pictured above) said: “Hugh has led the Council through one of the most challenging periods it has ever faced. “Over the past three years, the Council has been completely transformed in terms of decision-making and officer structures, cross-party working and financial stability, and a new dynamic and ambitious Council has emerged that has vision for the future. This will make a real difference to the people of South Ayrshire. 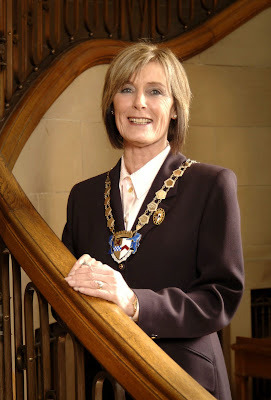 South Ayrshire Council Provost Winifred Sloan (pictured above) said: “Hugh has done a terrific job leading the Council since May 2007. His tenure has been one of achievement focused on making South Ayrshire Council a modern, ambitious organisation. His strong focus has been on the people, businesses and organisations within the local authority, and improving service standards. Working with cross-party support, he has transformed the Council. He has steered it to a position of financial stability, and we now have a clear strategic approach to our business. Hugh has worked tirelessly and has injected wisdom, experience and compassion to the role. He has worked relentlessly for the people of South Ayrshire, and we are indebted to him for what has been achieved over the past 3 years. Councillor Hunter will continue as Leader of the Council until a special meeting of South Ayrshire Council on Wednesday 3 February, where the future leadership of the Council will be considered. There are currently 644 Ayrshire business stories permanently archived on this site. To locate those of most interest to you, please use the site search facility in the top left hand corner of this page. Type your search term in the white box, then click the magnifying glass symbol.